Maude Church is an artist and a former employee of The Software Toolworks. She worked as a lead artist on the 1994 PC release of Mario's Time Machine. 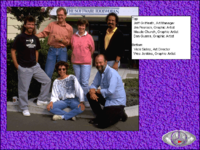 Maude Church (center right), next to Dan Guerra, Wes Jenkins, Vicki Sidley, Jeff Griffeath, and Jim Pearson. Church was hired at Software Toolworks as a tempoary staff members, but was hired permanently after working there for six months. She then worked on several other projects there before being given a role on Mario's Time Machine. She worked on the game as an art lead, taking a specific role in adding animations to sprites that previously did not have them, which meant that there were a lot of limitations. By the end of the project, she received a bonus for there was only one out-of-place pixel and for finishing on time. She later worked on the company's games based on The Tale of Peter Rabbit, including The Adventures of Peter Rabbit & Benjamin Bunny. She currently works as a freelance artist, occasionally exhibiting her art in shows and teaching classes based on art. ↑ 1.0 1.1 1.2 1.3 1.4 Interview with Maude Church (2017). Mario Boards. Retrieved October 7, 2017. This page was last edited on September 7, 2018, at 03:30.